Excellent news - the new season at the Teatro de la Zarzuela has opened earlier than usual, allowing one month more of programming. What's more, it does so with what will be the only revival of the season: the legendary 1990 production of La del manojo de rosas directed by Emilio Sagi. This is one of these stagings which seems untouched by the passage of time, and it will always be welcome. Everything has already been said about it many times. All that needs to be said here is to report on the effectiveness at the present cast list, with a few comments on the staging. The first of the two casts - first in order but not for any other reason, since the month's shows were equally divided between the two - was headed by Milagros Martín and Marco Moncloa as the romantic couple, with Paloma Curros and Rafa Castejón in the comedy roles. Martín made a superb Ascensión; her strong stage presence and musical effectiveness would have been enough by themselves to make the piece work. Moncloa was not at his peak in creating a patchy Joaquín, since though he acted most naturally he was not in such good form vocally. The stage work of the comedy couple was impeccable, and they also sang well given their limited vocal means. Curros portrayed the manicurist Clarita as coquettish, wacky and very, very modern - in 1930's terms, of course. Rafa Castejón on the other hand was as completely inside the skin of his character (in this case Capó) as is usual in all his appearances at this venue. In the second cast Beatriz Lanza and Carlos Bergasa had their counterpoint in the double act of Mar Abascal and Javier Ferrer. Lanza and Bergasa made a balanced pair of protagonists - she, elegant and measured; he, calm and fearless; both, deliciously timid. They sang the dúo habanera "¿Que está esto muy bajo?" which crowns the second act with huge effect. The comic pair acted with great fluency. Abascal's contained Clarita demonstrated much more confidence than Ascensión in her restored feminism. Javier Ferrer gave a consistently laid back reading of Capó, without losing anything in comicality. As for the three main performers common to both casts, they're due nothing but praise. Luis Álvarez played Don Daniel with great style (the role created in this production by the recently deceased Tomás Álvarez to whom the theatre dedicated this revival.) Mario Rodrigo made a very human and very well sung Ricardo. Then - as Espasa himself might say - with due candorosity the fact must be unveiled that Luis Varela, in spite of his inevitable modestiousness (and duly emphasizing his traumaturgical and infla-ovoid comedic face) raises his role to the heights of immensitude. In the pit we had the Orchestra of the Comunidad de Madrid very much in tune with Sorozábal's popular score, whether with Roa or Remartínez holding the baton. The Teatro de la Zarzuela chorus for their part were also effective. As for the group of actor-dancers, their excellent precision was greeted with great approbation. Sagi's staging is beautifully moulded: the conjunction of a hyper-realistic stage setting, elegant choreography, stylish costumes and spectacular lighting makes for a perfect visual product. There's a downside nevertheless to the scenic effectiveness due to a directorial decision. Sagi makes the middle scene of Act 1 take place in a same space, excessively extending the opening milieu and risking monotony through lack of a scene change. In addition, this decision robs us of a well-judged theatrical effect which shows Sorozábal's dramatic flair - the fact that Ascensión's romanza is sung to straddle the second and third scenes of the act, taking place during the scene change. What's more, the dialogue cuts - essential so that the second scene can take place at the florists instead of in Joaquín's apartment - render the story less intelligible, by making the hero's double life insufficiently clear. 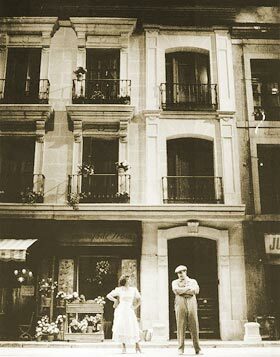 But these considerations on the dramaturgy aside, we should conclude by stressing once again that this Teatro de la Zarzuela revival leaves a good taste in the mouth, arising from the double circumstance of starting the season with a fine older production - and for taking as great a care with its restaging as with its premiere.